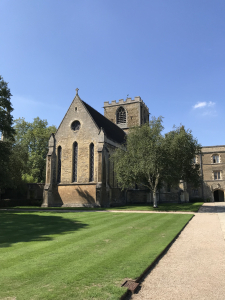 On Friday 31st August, seventy invited guests gathered in the beautiful surroundings of Jesus College, Cambridge, to celebrate what New Paths Music has achieved in its inaugural year as a charity, and to look forward to its future plans. Gathering in the historic Upper Hall for drinks and canapés were Friends and Patrons of the festival, representatives from organisations with whom New Paths has partnered – including Oundle for Organists and the Herbert Howells Trust – as well as a number of people being introduced to New Paths for the first time. The number of visitors who travel to Beverley specifically for the New Paths festival is increasing every year, adding a small but significant boost to the town’s economy and ensuring the charms of this wonderful market town are broadcast further afield. The decision to hold this event elsewhere in the country was a marker of the geographical spread of New Paths supporters, as well as an opportunity to tempt more people to sample the delights of the East Riding of Yorkshire! The founder of Jesus College, John Alcock, was a student at Beverley Grammar School in the fifteenth century, and New Paths was honoured to host the choir of Jesus College at its 2018 festival. 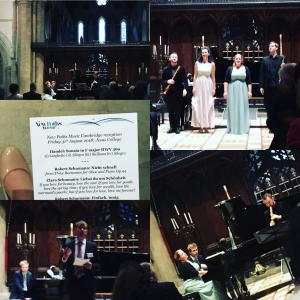 So the choice of venue was a natural one, and we are very grateful to the Master, Professor Ian White, for hosting the event, and to the Director of Music, Richard Pinel – also a New Paths trustee – for co-ordinating the event. On moving to the chapel, the audience was treated to a wide-ranging performance from fabulous New Paths artists past and future: Ian Wilson (recorder), James Turnbull (oboe) and Aoife Miskelly (soprano), all alongside Artistic Director Libby Burgess (piano). Repertoire ranged from glittering Handel to haunting Howells, whose oboe sonata was a welcome new discovery for many, and from Clara Schumann’s songs to Hans Martin Linde’s extraordinary avant-garde depiction of birdsong, written fifty years ago. The complete programme can be viewed here. Beverley was an important place in the middle ages and back then music flourished in the town, in particular in its two glorious gothic churches – Beverley Minster (which boasts a huge collection of minstrel carvings) and lovely St Mary’s (historic home to the town’s waits, who during the winter months would wake the town’s residents on dark mornings – whether they liked it or not – with musical noise). 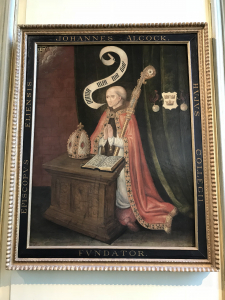 John Alcock, founder of this place, was the son of a Hull merchant, and the thriving musical life of Beverley in the middle ages was fuelled by the wealth of the town. Today the town – despite its extraordinary architectural riches – sits in what is by some measures the tenth poorest region of Northern Europe. And as with many other regions of the UK, music and the arts face headwinds. At New Paths we believe that music is a birth right of everyone – a part of what it is to be human and to experience life in all its fullness. Humans have been engaged in musical activity of one form or another for at least 30,000 years – a good 24,000 years before we were writing. Although not a local lad, Pythagoras – in the 6th century BC – had the vision to recognise that all life is united by the laws of mathematics and music. He saw music as the model for a perfect society and would prescribe music as medicine. Whilst you might not see music as sacred, the benefits that a thriving musical culture have for individuals and communities are undoubtedly profound. He went on to outline the big bold increase in public access to music in the East Riding that New Paths has set out to offer. The 2018 festival, he explained, brought 35 of the leading new generation artists from throughout the UK and Europe to the town for the week, to stage over forty events, over seventy percent of which were free, and many of which were specifically for families and young people. He singled out as a highlight the Musical Takeover of the Town, an entire day of free pop-up performances throughout the town, which attracted such a large crowd that some performances had to be repeated. We reached over 4,000 people, a quarter of whom were children, and were astonished to see the ways in which a vibrant music festival has the power to connect people and the place in which they live, fostering civic pride. Artistic Director Libby Burgess spoke about the forthcoming Beverley Chamber Music Festival, whose programme can be viewed here, and also unveiled hints about the programme for April 2019. Music is a language which can draw cultures closer together and in some small way foster international co-operation… An art form which promotes mutual understanding, broadens horizons, and seeks common human experience, is surely needed now more than ever. At New Paths we take seriously our responsibility to share music across as wide a spectrum of society as possible, and this is the area of our work that is ripest for development… Our education and outreach work, which has always been at the core of what we do, has the potential to grow more and more – perhaps even to a year-round programme. In 2019 we plan to hold a singing project over the weeks running up to the festival, culminating in a performance during the festival itself, which involves working with every single one of the primary schools in Beverley. If we were able to roll this project out year on year, every child in Beverley would be involved in an inspiring musical project during their primary education. Outlining New Paths’ commitment to bringing music to areas of society which are marginalized and don’t traditionally have access to world-class music, Libby spoke of the flagship 2018 project with Frederick Holmes School for children with profound and multiple special needs, and of the visits by musicians to old people’s homes. She also outlined plans for future collaborations with families who have experienced child loss, and with refugees. Our outreach work is not a token box-ticking exercise: it pervades every aspect of our programming, and we use our principal artists for these activities. Our plans are big and growing; they are currently limited only by manpower and finances, and it is in these fields that we are constantly seeking assistance. Roland announced that, to make the plans for 2019 a reality, New Paths needs to raise £80,000, and – in addition to applying to trusts and foundations – was looking to build up a broad base of support from individuals from throughout the UK and beyond. Attendees were asked to consider whether they could support the charity financially. The donation form can be found here. The rise of the robot poses perhaps one of the greatest challenges of all time to humanity, and supporting people like us, who are fostering creativity and problem-solving – surely some of the most critical lifeskills in this 4th Industrial Revolution – seems a pretty good investment. There has never been a more pressing time to champion the arts. Beverley is an out-of-the-way sort of place – not cut off, for it is only 2½ hours on Hull Trains to London – but its relative remoteness gives us and our musicians the freedom to experiment and be creative. We have been astonished by the musical results of that creativity. Like Britten in Aldeburgh and Haydn in Esterhazy, we believe that these special circumstances will allow us to create something of national and even international significance over the fullness of time, and to inspire other regions of the UK to invest in culture. We’ve seen how music can help to bring a place and people to life.